HomeHomes in Girona3 bedroom apartment with terrace and lots of light in the Barri Vell, currently under renovation and customizable. 3 bedroom apartment with terrace and lots of light in the Barri Vell, currently under renovation and customizable. The apartment is on the fourth floor of an old building currently under renovation, and has a constructed area of 97 m2. 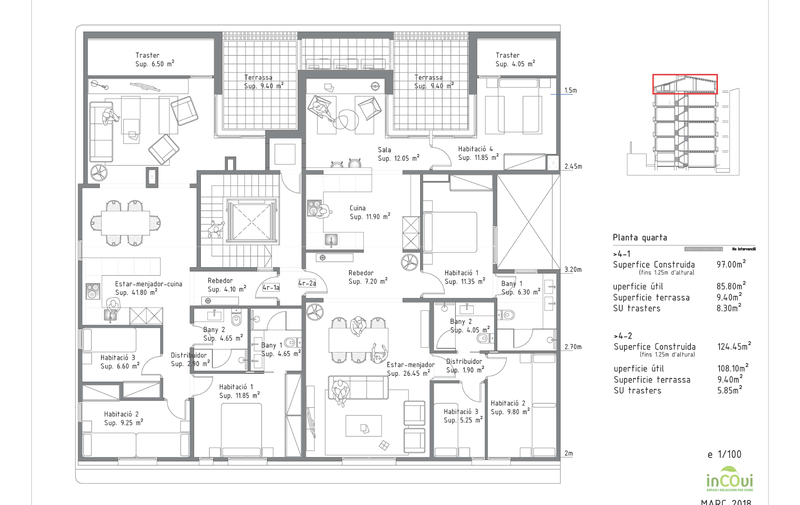 The distribution consists of living-dining room-kitchen, two double bedrooms –one of them with bathroom– a single room, a second bathroom and a storage room. The living room has access to a 9.40 m² terrace, with nice views over the city. The apartment is on the fourth floor of an old building currently undergoing rehabilitation. The living room has access to a 9.40 m² terrace, with nice views over the city. The apartment has the charm of belonging to an old building, with lots of light and a terrace, from where to contemplate the old city.